New Zealand Tall Bearded Iris "IRWELL DESTINY"
Another pleasant high quality surprise 'Irwell Destiny', by Ron Busch is a rich Rosy violet based Plicata with golden style arms giving the blooms a haunting inner golden glow, burnt orange coloured beards add the finishing touch. Bloom has excellent proportionate form, the ruffled standards are closed but not tightly so, the ruffling continues in the Falls that are a warm white with the distinct edging of rose violet complemented by an attractive spoke pattern radiating from the beards. Unconfirmed reports of re-blooming last season. Unfortunately 'Irwell Destiny' is an Iris with lost parentage. The up side, it is definitely fertile. Available from Wendy Begbie's "Amazing Iris Gardens", and this season Wendy is introducing four of Ron Busch irises, Irwell Aristocracy, Irwell Courage, Irwell Destiny, and Irwell Tribute. Be in quick to order these splendid New Zealand Bred Irises as they will be in much demand!! I would like to give a huge hat tip to Wendy Begbie, the owner of the brilliant “Amazing Iris Garden” for growing and promoting New Zealand Bred Irises and for supplying the above fantastic photo, and also a Big Hat tip to Ron Busch, a most discriminating hybridiser. New Zealand Tall Bearded Iris "FINEST HOUR"
I first published information about the heirloom iris 'Finest Hour' on New Years day 2010.Recently I had mentioned in the 'Polar Cap' feature a reference that Carlos Ayento of Brighton Park Irises had sent me the 'Finest Hour' photo to share with you all. To be honest the artist enhanced drawing displayed in both the 'Stevens' and 'Schreiners' catalogues and featured below is a wee bit short of the mark when it comes to an accurate portrayal of the Iris and at best could be defined as only helpful for ID purposes. It was certainly enhanced by the artist to show the iris in the best possible light. In her book ‘Iris Culture and Hybridizing For Everyone’ Wilma Vallette on page 313 noted the following, “Red Amoena’s have already appeared as in 1958 Mrs Stevens’ FINEST HOUR was introduced, from ((Naranja x Redmayne) x (Lagos x (Gudrun x (Lady Morvyth x Rangatira))) X (Russet Mantle x Three Sisters). It is a typical variegata, noisy haft markings and all, only on a white ground, rather than yellow, and very contrasty. In America, Chet Tompkins bloomed #55-185 in 1954, a red and white amoena in the 3rd generation from Colour Carnival and Three Cheers. His description sounds very outstanding-large, beautifully formed, with snowy standards, smooth hafted spectrum red falls, and a fiery red beard. Unfortunately when he moved to Oregon a year or so later, somebody stole the whole plant leaving him only one tiny rhizome from which to build up stock. A sister, #55-185A is similar, but with pink standards, and has already been crossed with Finest Hour, in an effort to combine the two lines, and something quite promising may be expected to appear. It has been suggested that Rumba Rose and Three Sisters, which both have reddish falls, might be of value in a program for red amoena’s, used with the yellow ones, and is the latter is a grandparent of Finest Hour”. Writing in his 1962 'Tell's Iris Garden" catalog, Tell Muhlestein stated that the bloom was smallish and noted that Frank Hutchings apparently selfed 'Finest Hour' and got a much improved form. To date I can not find any registration of any of the above mentioned crosses or seedlings. Jean Stevens in her catalogue description of this iris mentions that Finest Hour is a very early bloomer so I have saved the publication of the photo and additional information until close to the start of the New Zealand bloom season, and maybe New Zealanders interested in Historic Irises will be on the look out for another amazing Jean Stevens Iris. 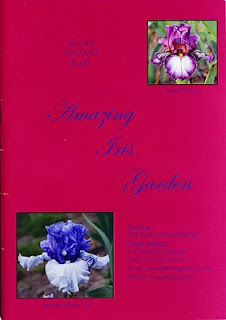 If you see this iris growing in New Zealand please do not hesitate to contact me. FINEST HOUR Mrs J. Stevens, Reg., 1955. Sdlg. 1/C11. TB, 36″, EM, re, W4. S. white; F. deep even red; some haft venations. (Naranja x Redmayne) x (Lagos x (Gudrun x (Lady Morvyth x Rangatira))) X (Russet Mantle x Three Sisters). Schreiners 1958, 'Novelties' Stevens Bros 1958-59 H.M. 1961 A.I.S. 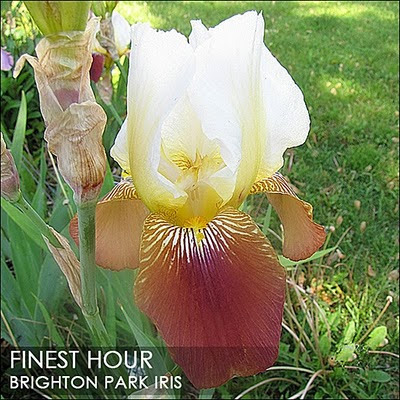 Once again I would like to give a large hat tip to Carlos Ayento, the Web-master of the brilliant Web Site “Brighton Park Iris”, and is also the Historical Iris Preservation Society, Databank Chair. Photo credit and copyright Brighton Park Iris. Tall Bearded Iris, "SOUL MUSIC"
This iris is an example on how sometimes Checklists can lead you down the garden path so to speak.The elegant red-violet Iris is the Duane Meek 1978 introduction "Soul Music" and it is well named for sure. With a colour approaching black and light to moderate ruffling with a silky sheen, its overall form is even better than the very fine "Darkside". Now here is the problem, both versions of the 1979 checklists, the Print register and the Electronic register, state "bronze beard tipped violet" but as you can see in the photo above it is a violet beard tipped bronze. So have we got the whole ID wrong!!! The above hybridisers description confirm's that we have got the right Iris. This goes to prove the more information you have to cross check an Iris the more comfortable you get with knowing you have the correct ID. This however is not the reason that attracted me to the Iris in the first place it was its pedigree. One of the Pod parents back two generations is the Lloyd Austin's 1965 registered Butter yellow Space Age Iris "Spooned Blaze" that has yellow horns ending in small spoons rising from deep-orange beard. Now, good quality Black Space Agers, in any class, are rarer than a blue moon so maybe this season its time to find out if 'Soul Music' is fertile and perhaps unlock its 'Space Age' potential. I'll keep you posted. Thirty four years old makes 'Soul Music' a Historic Iris, yet its undeniable elegance and modern form belies the fact. SOUL MUSIC (D. Meek, R. 1977). Sdlg. 113-1-0. TB 38-40" (97-102 cm) E-M. Fluorescent dark red-violet self, solid bronze shoulders; lightly ruffled Falls, bronze beard tipped violet. D121-1-8: ((Coraband x Spooned Blaze) x La Negra Flor) X Royal Heritage., D & J Gardens 1978. Space Age Iris "SNOW SPOON"
Just one of the stand-out irises I will look forward to this blooming season. Lets face it there has to be some payback to make all the weeding worthwhile. Ben Hager's "Snow Spoon" is a visual treat and several clumps grow at home among 'Graham Thomas' the Yellow David Austin roses. Irises with unusual decorative extensions to the beards are known as 'Space Age Irises'. Extensions to the beards range from horns (points) to spoons and flounces, and are so called because the ends of the horns expand to a larger petaloid, spoon or flounce like addition. I have always enjoyed the opinion's of Ben Hager and his published thoughts on Space Age Irises. Its would be fair to say that there is still a large number of Irisarians that still think of these irises as a spectacle of deformity and should have been sent to the compost, I would have to disagree, but that's no big surprise. The Space Age Iris have come to be accepted by even the conservative American Iris Society and have awarded the varieties 'Thornbird'(1997), 'Conjuration'(1998), and 'Mesmerizer'(2002), all hybridised by the late Monty Byers, a California breeder, the Dykes Medal. Space Age Irises are the non-conformist of the Iris world and long may they live. SNOW SPOON (Ben Hager, R. 1982). Sdlg. SP3453Wh. TB 38" (97 cm) M. White; yellow beard, white spoons. SP3228Wh: (D. Meek cream sdlg. x Lamia) X SP3094YSp: ((SP2638Hr: Spooned Blaze x Caro Nome) x (SP2635Hr: Kingdom x Spooned Blaze))., Melrose Gardens 1982. Photo credit and copyright Terry Johnson and Heritage Irises © . [Ref 1] 'LES MONSTRUOSITÉS CHEZ LES IRIS' page 197 of the report 'Les Iris Cultivès'. The Iris known as "Braemar Station"
My friends, oh my friends!!! The things I wrote and then deleted from this article! Words like, “Indignation”, “Deception,” and “Ignorance”! And then phrases like “I suppose an apology will be out of the question,” “smoke and mirrors,” “in denial of reality” and “yep we gotcha”!! Gone – all of them. It seems that even after waiting six years for a confirmed ID result that has exposed the iris ‘Braemar Station’ as just a impostor, a cultivar with lost labelling that was renamed, none of these reactions are appropriate for an Iris blogger. I am sure the above photo will interest you. It shows a group shot of 'Gypsy Queen' and 'Braemar Station' growing together this growing season in the garden of an eminent American irisarian prominent in the Historic Iris world. Would you care to guess which flowers are which? It would be difficult not to reach the conclusion the two irises are the one and the same. [Ref 2] So let’s look at how a 2005 registered iris could possibly be the same as the Iris 'Gypsy Queen' which the 1929 Check List attributes the breeding of to 'Salter before 1859' (his catalogue listed it in 1848). BRAEMAR STATION Carol Mackenzie by Gwenda Harris, Reg., 2005. 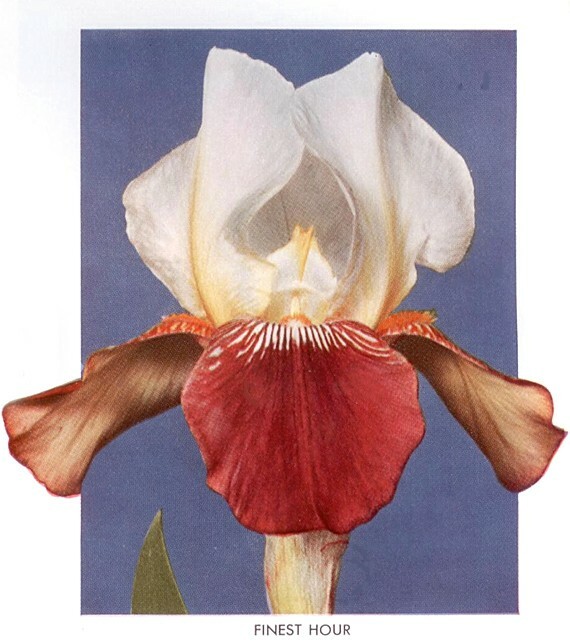 SPEC-X, 39″, (100cm), L. S. and style arms greyed yellow (RHC 62A); F. white tinged yellow at haft and edges, heavily striped deep red-purple (59A) deepening to almost solid black; beards white deepening to gold; sweet fragrance. I. variegata X unknown. Maritima 2005. It was apparently found in a horse paddock growing beneath a Lombardy poplar tree in the Mackenzie Country in New Zealand's South Island. It must be said that I do not have a problem with Carol Mackenzie finding an historic iris in a paddock and wanting to keep it – in fact she should be applauded for doing so – but the registration of this iris by Ms. Harris has always been of a concern. In 2007 an eminent European Irisarian wrote to both myself and Ms. Harris stating: "I am afraid its registration could cause confusion without a notice that it is a cultivar with lost labelling. The picture speaks for a variegata parentage but it is decidedly NOT a species, dry tops of spathes, at least, speak clearly for a hybrid origin. No one wild variegata can have such spathes". How is an Iris found in a paddock able to be registered with I. variegata as the pod parent?? What evidence was submitted at time of registration to justify this part of the pedigree???? The NZIS bulletin (September 2009 #179 page 17-18) published the introducer's self-reinforcing and awkward interpretation of how the registration could be justified with regards to ‘Braemar Station’ and part of the article stated "Iris variegata, I. pallida and perhaps I. aphylla were the main parents of modern TB cultivars. I. variegata was particularity prolific, but its progeny have had a confused history with many names and many spellings. Some early hybrids and cultivars like, 'Victorine' have been listed in catalogues under at least seven different names". Nothing new here!!! ‘Gypsy Queen’ also had been listed in catalogues under at least eight different names and this iris was sold in New Zealand under at least one of its synonyms – "Hamlet" listed in the 1904, H. C. Gibbons, Wellington Bulb Catalogue, page 17. It could have also sold in New Zealand in other catalogue listings by others as, ‘Queen of Gipsies' and ‘Virgil’. Ms. Harris has also stated in the same article: “The ‘Braemar Station’ debate is reminiscent of the confusion surrounding two other variegata cultivars, ‘Honorabile’ and ‘Sans Souci’, which went on for more than a century and is also described by Mahan 2007 [Ref 3].” Well sorry, but no its not! I am not sure how an American domestic ID problem that is still subjected to discussion in America today becomes a justification for the registration of 'Braemar Station'. The difference between the above described scenarios and the registration of ‘Braemar Station’ is that all the confusion with catalogue published names of historic irises occurred prior to the publications of the 1929 or 1939 checklists. As irises rose in popularity in North America and Europe in the 1920s, an immense amount of research work in Catalogues and Journals, as well as in the recognised reference books, was undertaken in Britain and America prior to the publication of the check lists, to ascertain which varieties circulating under different names were in fact, the same plant, and to determine which was the original and therefore the legitimate, so that each iris cultivar, past, present, and future, would carry one “approved” name which identified it uniquely. Since then, there have been very limited examples to date where anyone has blithely attached a new registered name to an historic Iris with lost ID, and probably even less that have had a parentage fabricated. Now that the iris ‘Braemar Station’ has been grown alongside ‘Gypsy Queen,’ it has removed any doubt that the two named irises are one and the same. The day has come for registration of 'Braemar Station' to be withdrawn and nothing could be more inept than publication by Ms. Harris of any more dubious reasons of why the iris was registered in the first place. In case of ID confusion with the above photo, the iris labelled and sent to America by Ms. Harris as 'Braemar Station' is the stalk on the left of the photo, all others in the shot are ‘Gypsy Queen’. The original article 'Braemar Station- The Iris' by Gwenda Harris was published in The New Zealand Iris Society, June 2005, Bulletin 166, and then republished in 'ROOTS' the Journal of the Historic Iris Presevation Society, Volume 20, Issue 2, Fall 2007, the later a real surprise as by then many doubts had been raised, both in New Zealand and internationally surrounding the authenticity of this Iris. A second Article,'Braemar Station- An Update' by Gwenda Harris was published in the New Zealand Iris Society, September 2009, Bulletin 179. Update 2014; The truth about this iris is scarce but the supply has always been in excess of the demand. The NZIS on their web site now refers to photos of this iris as an 'Iris of no certain identity'.